Grilling turkey can be tricky. But this recipe uses some of the tips I present on my How to Grill a Turkey page to produce an awesome whole roast turkey. Some of the parts of this recipe have been adapted from others meant for the stove, but it works wonderfully on the grill too as long as you take your time and use indirect heat to keep a low and slow heat to slowly grill the bird. Brining helps seal in moisture and flavor. 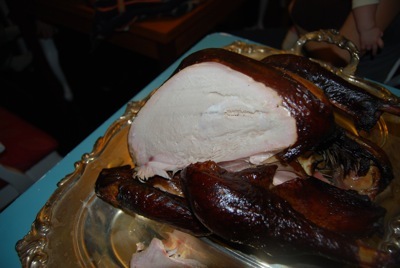 If you are looking for general info on grilling turkey check out the How to Grill a Turkey page. I've also got a fun recipe for Grilling Turkey Legs that is a summer barbecue favorite. 1 Whole Turkey: I'd use a smaller one but if you go slow a big one works too. 10 to 14 pounds is ideal but if you want to do bigger, more power to you! A few days ahead of cooking, thaw your turkey in the refrigerator if it came frozen. You can prepare the brine solution ahead of time but at least 24 hours before you plan to be grilling turkey. Combine the stock, salt, sugar, peppercorns, ginger and allspice in a large pot and heat slowly until all the salt and sugar are dissolved. Bring just to a boil and then turn off the heat. Let sit and cool to room temp. Then refrigerate it until ready to use. The day before Thanksgiving (or whenever you are going to be grilling turkey), combine the brine and the 1 gallon of water in a large bucket or brining bag. Add the thawed turkey and make sure it is completely submerged in brine on all sides. If it floats at all you can weigh it down by placing something heavy, and inert, in the body cavity or by laying a plate on the top. Cover and refrigerate for 10 to 16 hours. You might want to turn the bird in the brine once or twice during the brining period. The day of cooking, preheat the grill with charcoal (or gas if you prefer) with all the fuel on one side of the grill. Remove the bird from the brine solution and rinse with water gently. Pat dry. If you want to have a pre-fitted foil cover for the breast or whole turkey now is a good time to press and oiled piece of foil over the bird which can be removed and used later during grilling if you wish. Put the aromatics including apple, onion, cinnamon and water in a bowl and microwave briefly, about 3 to 5 minutes to partially cook and release the aroma. Add these aromatics plus the herbs to the turkey's body cavity. Tuck the wings underneath the bird and coat the skin liberally with good oil. I like using olive oil. If you have a remote meat thermometer now is a good time to insert it. Place the needle probe deep into the thickest part of the breast meat but not touching the bone. When your grill is ready place a metal pan full of water or turkey stock under the side of the grill without charcoal (the area for indirect heat). Place the bird on indirect heat with the breast side up, close the lid and initially keep all the vents open to keep a high temperature (around 500 degrees) for about 20 to 30 minutes. You can also add soaked smoking woods at this time to the hot embers. Reduce the heat to approximately 350 degrees by closing the vents on the grill lid partially (or by turning down the burners if you are using a gas grill). If you wish, you may also place the foil over the bird breasts to help keep them from cooking too fast. Keep the lid closed while cooking and continue cooking an additional 1-1/2 to 3 hours until the internal temperature of the breast reaches 161 degrees. The actual cooking time will vary depending on the size of the turkey, the heat of your grill and other factors. Once the interior of the breast has reached 161 degrees, remove the bird from the grill and place on a platter. Cover with aluminum foil and let rest at least 15 minutes and up to 30 minutes before serving and carving. It is very important to let it rest! Serve your grilled turkey to applause and fanfare with any fixin's you desire! Done with the Grilling Turkey Recipe? Return to the Grill Recipe page.